What’s the Best Food Choice for My Dog? Canine nutrition is not immune to some of the myths that also pervade the human food industry. The term ‘organic’, for example, is a word we see on both human and dog food packaging frequently. It is nothing more than a savvy marketing tool. Consumers see the word ‘organic’ on a product and are immediately tempted to buy it simply because of the connections our imaginations make. We see ‘organic’, we automatically think natural, with no pesticides, harmful chemicals, or low-quality ingredients. However, the fundamental danger in buying into the ‘organic’ myth is that there is no regulation in the food industry (canine, human, or otherwise) that places even the loosest restrictions on the use of this word. Since there is no monitoring of the term ‘organic’ being used on food packaging, there are no penalties for misleading advertising that employs this strategy. Therefore, just because you see dog food that claims to be organic doesn’t mean it is any better, or any worse, than the product beside it that markets itself in a different way. Other dog nutrition myths you shouldn’t buy into include the idea that food packaging labeled as ‘premium’ is somehow better. ‘Premium’ is just another way of saying ‘more expensive’: another clever marketing ploy. The advertising strategy behind this plays on the potential guilt dog owners feel if they don’t give their pet the best. Isn’t it funny how we have no problem buying a cheaper brand of human food items like soups or canned vegetables, but we are subconsciously guilt-tripped into being magnetically driven towards the dog food that costs two or three times more than the economy brands? Another myth perpetuated by dog food companies who want to trick the consumer into thinking only their produce is high quality is to convince us of the inherent ‘danger’ of grains and corn in dog food. Grains and corn are affordable ingredients and unfortunately, this myth is giving them a bad reputation. It is certainly true that some dogs are allergic to starchy products, particularly if they’re gluten intolerant. However, the myth exaggerates the frequency of these allergies occurring: in reality, allergies can be triggered by any ingredient in dog food — including the more expensive ones! Finally, perhaps the most ridiculous myth about dog food is that you should avoid commercial products altogether and feed your dog raw and natural foods only. This appears to be the canine version of the paleolithic, also known as the paleo, or caveman, diet. The caveman diet is a nutritional fad that promotes eating only what cavemen would’ve eaten while they were out hunting and picking berries off trees. Thus, anything processed or modern is forbidden, and the main components are cooked meat (since cavemen could create a fire), fruits, vegetables, nuts and seeds. Bread, pasta, rice, candy, meal-makers, sauces: all of these are a big no-no because a caveman was able to survive perfectly without them. The philosophy behind this is that our bodies weren’t made to digest rich and processed foods, and it is better for our health to eat the same thing our ancient ancestors ate. It’s as if no one ever heard of evolution! Anyway, this human nutrition fad has extended to the world of dog food, but supporters are even more extreme when it comes to their furry friends. 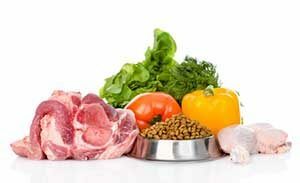 The caveman diet for dogs consists of raw foods, including raw meat. Common sense dictates that this isn’t a sensible choice for domesticated pets, as raw meats can contain bacteria and pathogens that could seriously harm them. Moreover, unless your dog eats anything and everything, try feeding a dog all of the balanced nutrients they need in the raw version. This is a close to impossible task because dogs, unlike cats, are not strict carnivores. 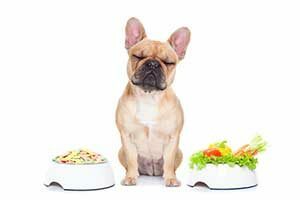 A well-balanced dog diet includes meat, fruit, vegetables, and grains. If you’re thinking the raw diet sounds appealing, just try feeding your dog raw vegetables with no gravy and see how long you last before you buy commercial dog food again! There are dogs who will gladly munch a raw carrot, but other dogs turn their nose up at anything that even resembles a fruit or vegetable. This is the number one thing to look out for in the dog food you buy. There is nothing as important as the nutritional content of the dog food you buy. Most commercial food brands are formulated to include the necessary nutrients a dog requires, but sometimes dogs need more of one kind of nutrient than another. All dogs are individual, and have unique nutritional needs. Don’t rush to buy the food with the biggest writing or fanciest packaging: read the label instead. You might have to try out a few different foods before you find the one you, and your dog, likes best. Test each food for a week or two and use the following guidelines to find out if it’s a good one: if the dog is happy and behaving in accordance with their normal personality, with bright, moist eyes and nose, and a glossy coat, you’re onto a winner. 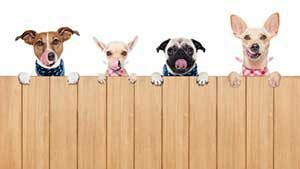 Choosing wet or dry food can be a confusing decision for a dog owner, as there are pros and cons for each. The type of food you choose in this respect depends largely on the taste preferences of your dog (some dogs will only eat wet food), your budget, and your priorities for your pet. For example, a well-known con of wet food is the fact that the processed ingredients can cause tooth decay in dogs over time. Dry food is better if you want to maintain your pet’s oral health. On the other hand, wet food provides more moisture than dry food. This is a shaky argument, since a dog can drink as much water as they like, but the moisture content of wet food is seen as an advantage over dry food. However, this can be easily remedied by adding water into the dry food, or even mixing a little bit of wet food in with the dry. Alternatively, if you want your pet to have healthy skin and a glossy coat that isn’t prone to dryness or itchiness, adding a tablespoon of extra virgin olive oil will supplement the moisture content of dry food very effectively. If your dog ever has an upset stomach, feed it plain yogurt. The good bacteria will help stimulate the immune system and they’ll be bouncing around normally soon enough.